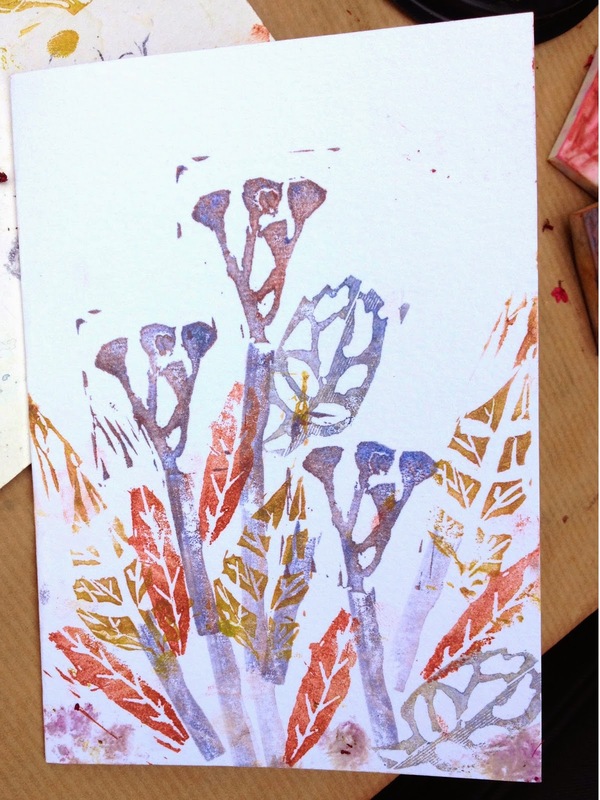 tanja wilmot illustration: Carving leaf stamps from erasers and other planty arts. 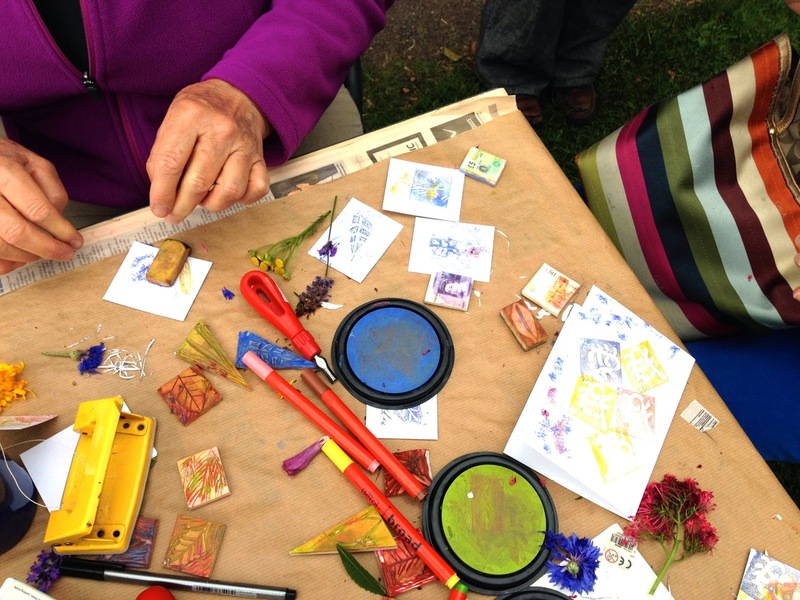 Carving leaf stamps from erasers and other planty arts. 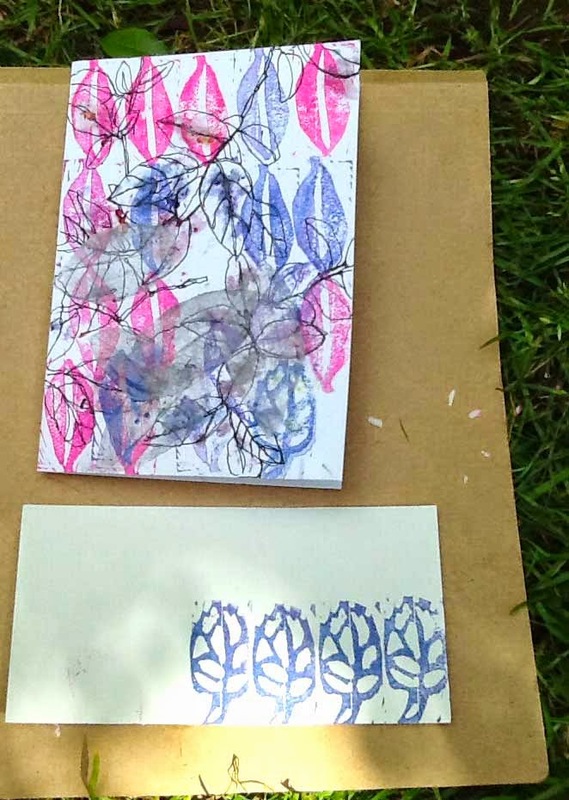 For ages, I've had a board for hand carved plant stamps on pinterest, so when the lovely folks at St Mary's Secret Garden asked me to do an art workshop for Open Garden Squares weekend, I thought hello, rubber stamp making. 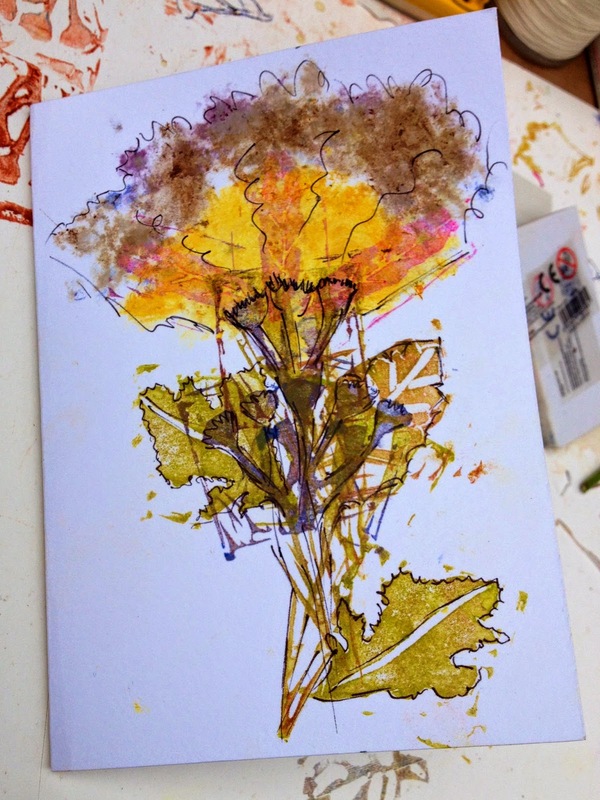 I added another activity too - um, the very technical art of plant bashing. A most direct thing, as in say... cornflower petals + gently bashing a small stone onto card = cornflower blue pigment transferred. Simple. 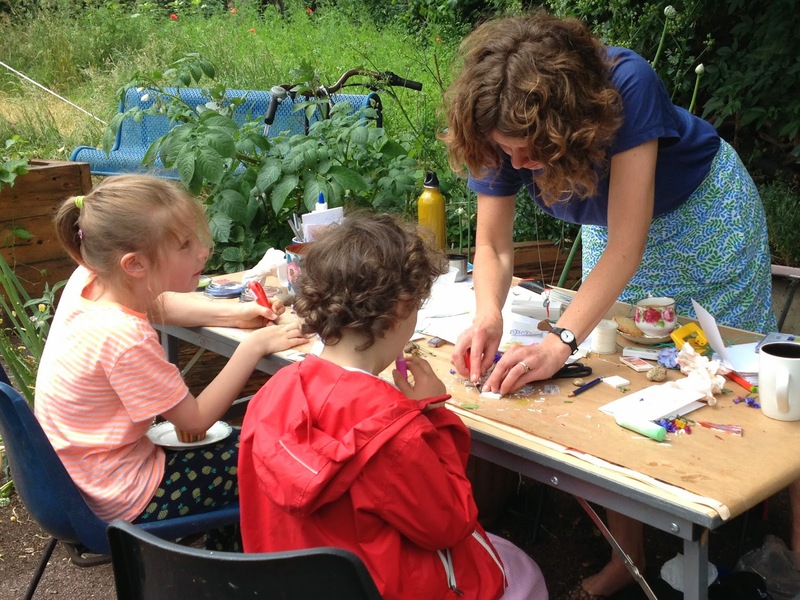 It needed to work as a drop in workshop for all ages. On a micro budget. 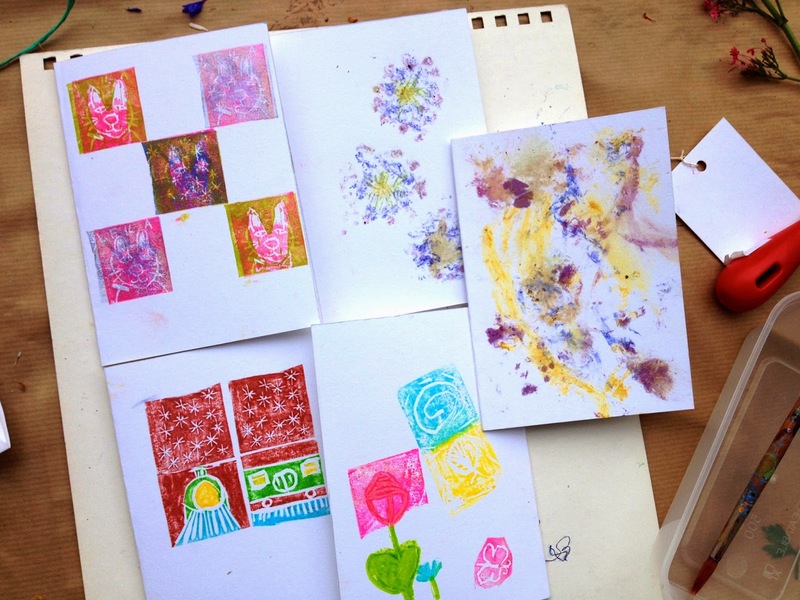 I settled on card making, and of course had elaborate plans for the various stages. Which I thankfully chucked out - I know from the art workshops I did when I was teaching English in Asia that it's good to plan carefully but then let go of how it actually unfolds. Participants make the magic happen in their own way. I did a tryout using printing over contour drawing and a teeny bit of plant bashing to use as an example, but of course on the day it evolved into something much better than I could have worked out on my own. 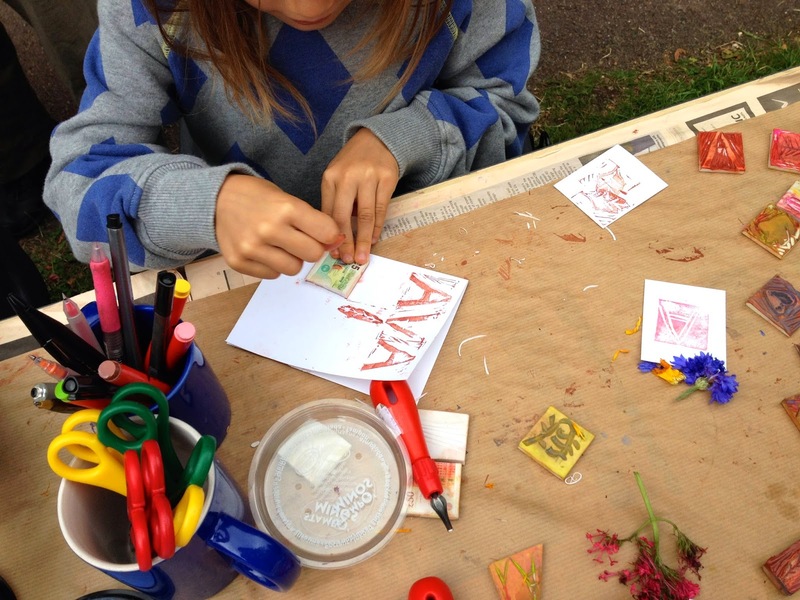 It was so lovely to see how children approached card making. 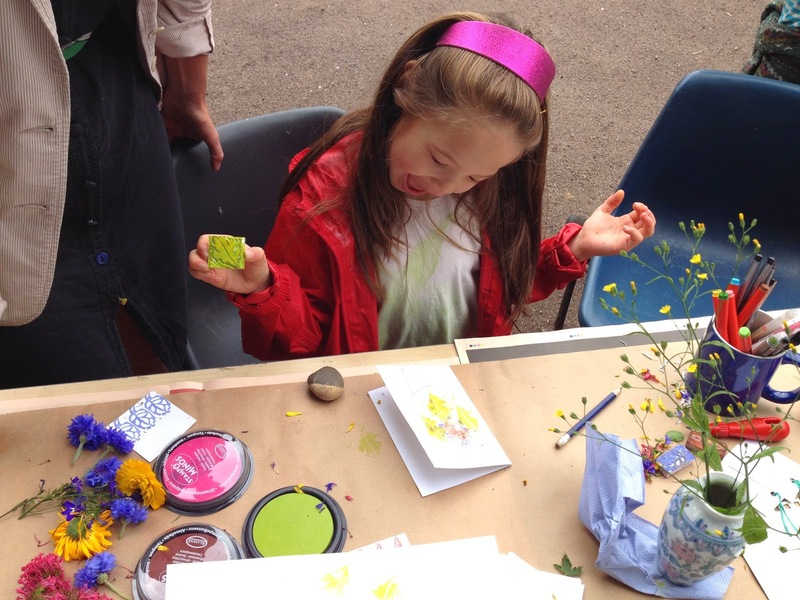 Some loved to draw, some really got into the plant bashing, and most children really loved carving the stamps and exploring ways to print them. It was Father's Day on the Sunday - added motivation. 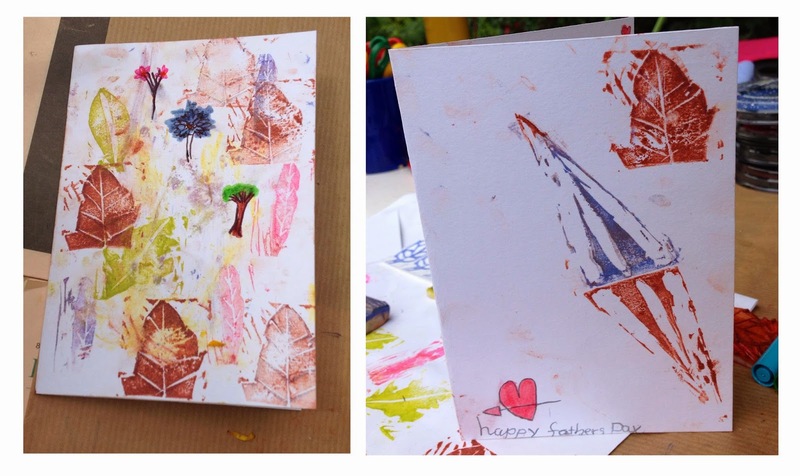 K made the card below right - using a grass blade stamp he'd carved - for his dad who is currently away in Cameroon for long stretches on business. It was a compass, he said. 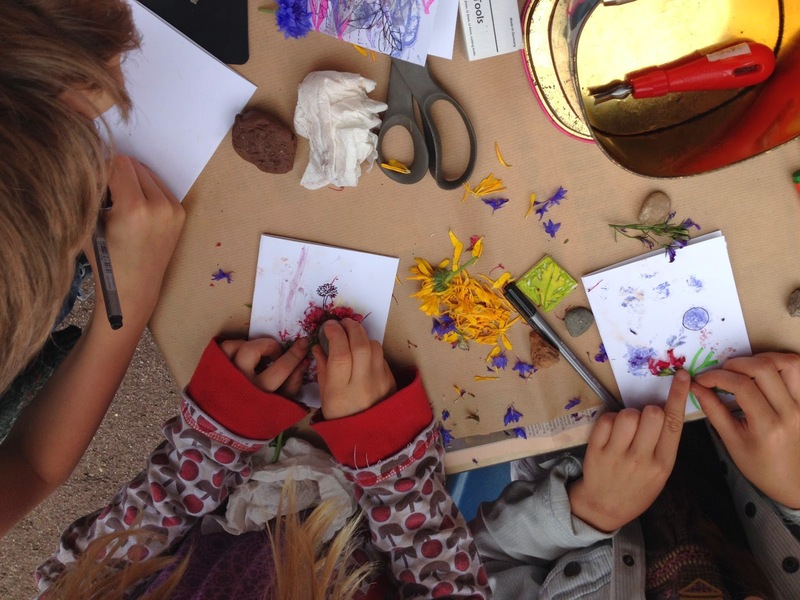 It was lovely to see how children readily learn from one another. L, who is on the right in the photo above, really got into it and, together with her design lecturer dad, made a whole range of stamps, including a trade mark to print on the back of each card, below. 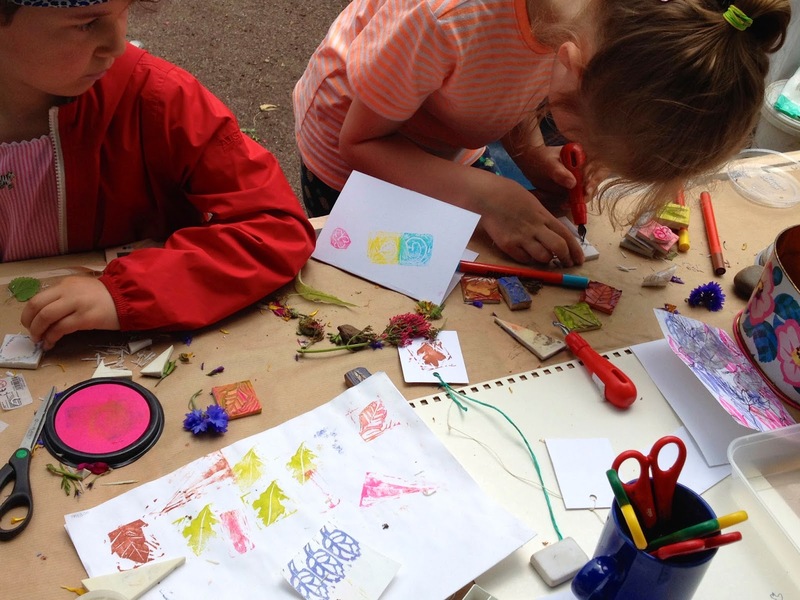 Happily, plenty of adults gave themselves permission to have fun with the stamps and play too. Things got more figurative, as is our way, but I think no less playful. I loved how colours got more subtle as the stamp pads got messier. 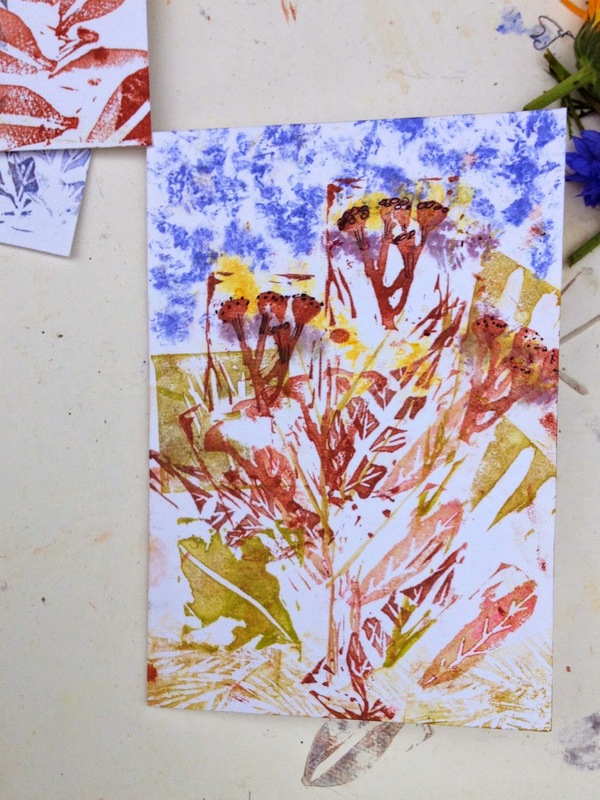 The yellows and blues below are from cornflowers and calendulas. No guarantees as to lightfastness alas, but maybe that's not the point. 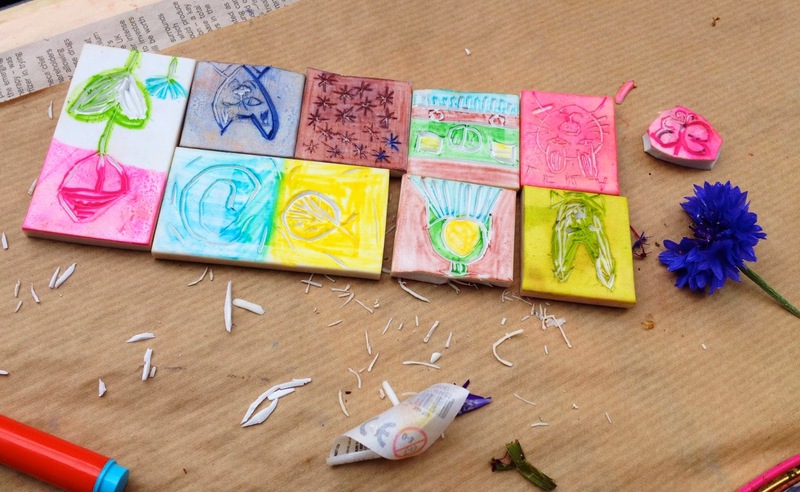 We all had fun, and I finally got to explore carving stamps from rubbers. Watch this board on pinterest, I look forward to adding some stamp pictures of my own.